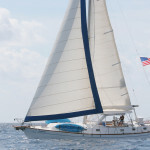 When venturing on sailing trips in the Caribbean, there are many aspects to keep track of, especially if you want to start sailing a boat by yourself some day or if you don’t know much about sailing and you need a charter company, you can rely on us to provide you with advice and support on making your vacation as fun as safe as possible. One of the most important things to remember when you’re a first time sailor is to not venture too far and to make sure a professional crew is in charge of your sailing expedition. Longer trips can have a negative influence on people who have never set foot on a boat or ship in their lives, and in the case of an emergency, you have to feel confident that you can rely upon your captain and crew. The first thing to do is to take sailing lessons. This will easily enable you to get accredited as a sailor and convince charter companies to lend you their sailboats for a relaxing vacation trip with only you and your friends or loved ones. Always keep in mind that safety comes first, and aside from checking to see if all the insurance papers are in good order, it’s a good idea to make sure the sailboat is equipped with radios, safety vests, signaling flairs, replacement parts and – in case you’re chartering a motorized boat or yacht – extra fuel. Finally, you can’t really leave anything to chance, so before you set out on a trip – especially a longer one – always remember that timing is not always precise and factor in the weather conditions and whether or not any unforeseen events might end up keeping you in one place longer than you’d normally want to stay. The charter company you choose also plays a major role in ensuring that you’re safe, not only by checking the boat’s structural integrity, but also by providing you with the best equipment and safety gear for sailing, snorkeling, diving or any other activities you may be interested in. Sopris Charters is one of the companies you can rely on. Dealing with sailing trips in the Caribbean for years, we have been helping tourists brush up on their sailing skills and making sure that even the most remote adventures go entirely smoothly.